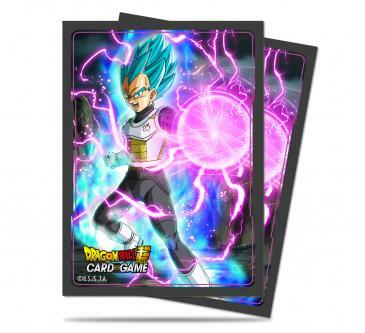 Protect your cards and store them in style with this Official Dragon Ball Super Deck Box featuring "God Charge Vegeta". Ultra PRO's Deck Boxes are designed to hold and protect your cards from popular trading card games such as Dragon Ball Super Trading Card Game by Bandai, Magic: The Gathering, Yu-Gi-Oh! and Pokémon. This Deck Box is made from archival-safe polypropylene materials and holds up to 80 standard (Magic) size cards in Deck Protector sleeves. The box is printed with beautiful full color artwork and comes with a bonus deck divider. 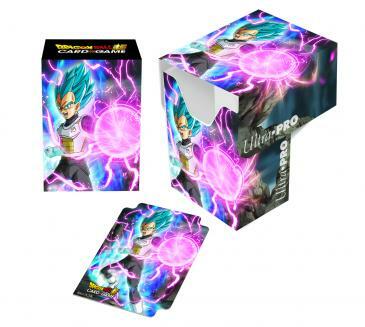 Made by Ultra PRO in partnership with BANDAI CO., LTD.
Official Dragon Ball Super Deck Box featuring "God Charge Vegeta"
Fight your opponent in style at your next gaming session with these official Dragon Ball Super Protector sleeves featuring "God Charge Vegeta"! Ultra PRO's Deck Protector sleeves are designed to protect you trading card game cards from damage during game play. They are sized to fit standard (Magic) size gaming cards and made with archival-safe polypropylene film. Each pack contains 65 sleeves with high resolution and detailed printing. Made by Ultra PRO in partnership with BANDAI CO., LTD.